Suwon[a] (Hangul: 수원; Hanja: 水原, Korean pronunciation: [su.wʌn]) is the capital and largest metropolis of Gyeonggi-do, South Korea's most populous province which surrounds Seoul, the national capital. Suwon lies about 30 kilometres (19 miles) south of Seoul. It is traditionally known as "The City of Filial Piety". With a population close to 1.2 million, it is larger than Ulsan, although it is not governed as a metropolitan city. Suwon has existed in various forms throughout Korea's history, growing from a small settlement to become a major industrial and cultural center. It is the only remaining completely walled city in South Korea. The city walls are one of the more popular tourist destinations in Gyeonggi Province. Samsung Electronics R&D center and headquarters are in Suwon. The city is served by two motorways, the national railway network, and the Seoul Metropolitan Subway. Suwon is a major educational center, home to 11 universities. Suwon is home to football club Suwon Samsung Bluewings, which have won the K League on four occasions and AFC Champions League twice. The KT Wiz of the Korea Baseball Organization also plays in Suwon. In ancient tribal times, Suwon was known as Mosu-guk (Hangul: 모수국). During the Three Kingdoms era, however, the area comprising modern Suwon and Hwaseong City was called Maehol-gun (매홀군). In 757, under King Gyeongdeok of the Unified Silla, the name was changed to Suseong-gun (수성군). In 940 during the Goryeo dynasty changed again in to Suju (수주). King Taejong of the Joseon dynasty renamed the city to Suwon in 1413. In 1592, during the Imjin wars, Commander Yi Kwang attempted to launch his army toward the capital city, Seoul (at the time called Hanseong). The army was withdrawn, however, after news that the city had already been sacked reached the commander. As the army grew in size to 50,000 men with the accumulation of several volunteer forces, Yi Kwang and the irregular commanders reconsidered their aim to reclaim the capital, and led the combined forces north to Suwon. Later, during the Joseon Dynasty, King Jeongjo made an ultimately unsuccessful attempt to make Suwon the nation's capital in 1796. Part of this project was the construction of Hwaseong Fortress, a fortified wall running around the entire city partially intended to guard the tomb of his father, Prince Sado, which he had located there. The walls were one of Korea's first examples of paid labour, (corvée labour being common previously). The walls still exist today, though they (together with the fortress) were damaged severely during the Korean War. Hwaseong originally was constructed under the guidance of philosopher Jeong Yag-yong. Shortly after the death of King Jeongjo (1800), a white paper detailing the construction of the fortress was published. This proved invaluable during its reconstruction in the 1970s. The fortress walls once encircled the entire city, but modern urban growth has seen the city spread out far beyond the fortress. The walls are now a designated UNESCO World Heritage site, and often are used in materials promoting the city. The Korean War greatly affected Suwon, as the city changed hands four times. Very shortly after the outbreak of war, the 49th Fighter Wing of the United States Air Force was dispatched to Korea from Japan. Its first task was to evacuate civilians from Suwon and Gimpo, but Suwon soon fell to the advancing North Koreans. Shortly before the Battle of Osan, the first conflict between United States and North Korean forces, on July 4, 1950, defenses were erected on the road between Suwon and nearby Osan (then still under Southern command). The next day, Northern troops advanced south. In the 3½-hour battle which followed, 150 American and 42 North Korean soldiers were killed and the United States troops were forced to retreat. The North Korean advance southwards to take Osan was delayed by an estimated seven hours. On December 16, 1950, the Greek Expeditionary Force relocated to Suwon, attached to the US 1st Cavalry Division. From November 6, 1951, the United States Air Force's top fighter pilot Gabby Gabreski was in charge of K-13 Air Base in Suwon. By the end of the war, Suwon was in South Korea. A memorial to the French military stands in Jangan-gu, near the Yeongdong Expressway's North Suwon exit. Suwon became the capital of Gyeonggi-do on June 23, 1967. On July 1, 1988, Jangan-gu and Gwonseon-gu was installed. On February 1, 1993, part of Jangan-gu and Gwonseon-gu	was separated and these parts became a new district, Paldal-gu. Suwon lies in the north of the Gyeonggi plain, just south of South Korea's capital, Seoul. It is bordered by Uiwang to the north-west, Yongin to the east, the city of Hwaseong to the south-west, and also shares a short border with Ansan to the west. There are a few hills around Suwon. 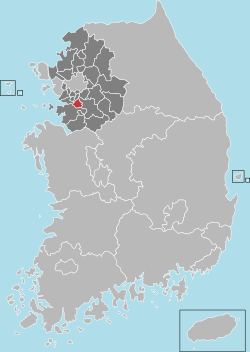 The highest of these is Gwanggyosan to the north, on the border with Yongin, though those to the east are more numerous. Gwanggyosan is 582 metres (1,909 ft) above sea level. Most of the streams passing through Suwon originate on Gwanggyosan or other nearby peaks. Since Suwon is bounded to the east by other hills, the streams, chiefly the Suwoncheon (and one notable tributary being the Jungbocheon), flow southwards through the city, eventually emptying into the Yellow Sea at Asan Bay. The entirety of Suwon is drained in this manner. As is true of all the South Korean mainland, there are no natural lakes in Suwon. There are, however, many small reservoirs, namely Seoho (서호) near Hwaseo Station, Ilwon Reservoir (일원 저수지) near Sungkyunkwan University, Bambat Reservoir (밤밭 저수지) near Sungkyunkwan University Station, Ilwang Reservoir (일왕 저수지) in Manseok Park, Pajang Reservoir (파장 저수지) near the North Suwon exit of the Yeongdong Expressway, Gwanggyo Reservoir (광교 저수지) at the foot of Gwanggyosan, Woncheon and Sindae Reservoirs (원천 저수지 & 신대 저수지) near Ajou University (아주대학교), Geumgok Reservoir (금곡 저수지), a small reservoir at the foot of Chilbosan, and the larger Wangsong Reservoir (왕송 저수지), located mainly in the city of Uiwang, but its dam located in Suwon. At the closest point, being the Chilbosan ridge (239m) to the west on the border with Ansan, Suwon lies 6 kilometres (3.7 mi) from the Yellow Sea coast. The newest of these is Yeongtong-gu, which was separated from Paldal-gu on November 24, 2003. These districts are in turn divided into 42 dong. 50.2% of the population of Suwon is composed of male residents. Indeed, it is only in Paldal-gu that the number of female residents is greater than that of males. 1.85% of the population is of foreign nationality, the highest concentration (2.3%) being in Paldal-gu. Further information regarding the residents of each district is shown below. Overall, the population of Suwon is increasing, but the domestic population is falling. For example, the Korean population of Suwon fell by 585 from December 2007 to January 2008. However, both genders of the foreign population increased in number in each gu in the same time period. It appears to be a pattern that the foreign population is increasing, as Suwon also saw a 13% increase in the number of registered foreigners residing in the city in the first half of 2007. The only gu currently showing an increase in population is Gwonseon-gu (though the same was until recently true of Paldal-gu), while all others have falling number of residents, especially Jangan-gu and Yeongtong-gu. There are 11 universities in Suwon and 2 colleges, and these include Sungkyunkwan University's Natural Sciences Campus, Kyonggi University, Ajou University, Kyunghee University, Dongnam Health College, Gukje Digital University, Hapdong Theological Seminary, and Suwon Women's College. The University of Suwon is not actually in Suwon, but in the neighbouring city of Hwaseong. The agricultural campus of Seoul National University was located in Suwon until 2005, but is now in Gwanak-gu, Seoul. There are also 2 junior colleges in Suwon. There are 33 high schools, 37 middle schools, 81 primary schools and 107 kindergartens in Suwon. Suwon has three schools devoted to special education, namely the Jahye Institute, the School of Suwon Seokwang and Dream Tree Special School, and also has wings of mainstream schools for students requiring special education, being the Special Education School of Suwonbuk Middle School, the Special Education School of Suwon Girls' Middle School. The main industrial employer in Suwon is Samsung. In fact, Samsung had major facilities Seoul, but at the beginning of the Korean War, inventories were so damaged that the founder, Lee Byung-chul was forced to start business again in 1951. Samsung Electronics was founded in Suwon in 1969 and it now has its headquarters and a large factory complex in central Suwon; it is the city's largest employer. Other companies with offices here include SK, Samsung Electronics, Samsung LED, Samsung SDI and others. Hwaseong Fortress is Suwon's most notable attraction. Built in 1796, the entire city used to be encircled by the walls, but now Suwon has expanded beyond this boundary. Hwaseong is also listed as a UNESCO World Heritage Site. Haenggung Palace, within Hwaseong, is another noteworthy historical attraction. On completion of the Bundang Line extension, Suwon will also be only a few stops from Singal, the location of the Korean Folk Village, and the Everland theme park is nearby in Yongin. The path around the walls of Hwaseong Fortress is popular with locals and tourists for sightseeing and walking. Manseok Park in northern Suwon has a 1200m track around a lake. Other facilities at Manseok Park include tennis (indoor & outdoor), soccer (dirt and artificial turf) and the Suwon X-Games skatepark. Various other parks are dotted around Suwon and several ski resorts and hiking trails are within easy reach of the city. Including Suwon Hwaseong, Suwon city offers various tracking, tour and festivals for tourists. Suwon has several sports facilities, including an archery field, badminton courts, ten-pin bowling lanes, indoor swimming pools, tennis courts, soft tennis courts and football pitches. Suwon Gymnasium hosted the handball events in the 1988 Summer Olympics; it has a capacity of 5,145. Suwon is home to the Suwon World Cup Stadium, a venue during the 2002 FIFA World Cup and home to K League 1 team Suwon Samsung Bluewings. Suwon FC, who competes in K League 2, and Suwon UDC, who competes in the WK League, play at the Suwon Sports Complex. Suwon is home to KBO League team KT Wiz since 2015. The team plays at the Suwon Baseball Stadium. The city was previously the home of the Hyundai Unicorns, but the team folded after the 2007 season. Basketball teams Samsung Thunders (men's basketball team) and Samsung Life Bichumi (women's basketball team) were also based in Suwon in the past. Woncheon in the Yeongtong-gu district also has two amusement parks, Woncheon Greenland and Woncheon Lakeland. But now it is closed. There is Gwanggyo Lake Park behind the back gate of Kyonggi University. Nearby there has also [Lotte Cinema] theater in Lotte Outlets. There are many cafes and restaurants. Suwon City Council prides itself on the condition of its public lavatories. It has made efforts in recent years to ensure that new lavatories are clean and while improving existing facilities. There are now guided bus tours of the municipal restrooms offered for visitors. Suwon has several stations on Seoul Subway Line 1, which runs North–South through the city, namely Sungkyunkwan University, Hwaseo, Suwon and Seryu. The Bundang Line also crosses Suwon East-West, terminating at Suwon, and the Suin Line connecting Suwon Station to Incheon is under construction. Until 1973, the Suryo Line also connected Suwon to Yeoju. The Yeongdong Expressway (Number 50) passes through Suwon and two exits on this motorway lie within the city limits, being North Suwon and East Suwon. Suwon is also served by the Suwon exit of the Gyeongbu Expressway (Number 1), though this lies a short distance east of the Suwon's limits, near Singal in the city of Yongin. In 2013, the city hosted the EcoMobility World Festival in the Haenggun-dong neighbourhood (pop. 4,300), where for a month, streets were closed to cars as a car-free experiment. Instead of cars, residents used non-motorized vehicles provided by the festival organizers. The experiment was not unopposed; however, on balance it was considered a success. Following the festival, the city embarked on discussions about adopting the practice on a permanent basis. In 2017, Suwon Station transfer center was opened. It was installed to disperse buses and taxi stands in the eastern plaza of Suwon Station. There are two newspapers based in Suwon. These are the Gyeonggi Daily (경기일보) and, since 1960, the Gyeongin Daily (경인일보). The former is based in Jangan-gu, with the latter's offices being in Paldal-gu. Both feature news exclusively in Korean. The Air Force has a base in Jang-ji dong, Gwon-sun gu, Suwon. This was used by the United States Air Force during the Korean War. The base is now occupied mostly by the ROKAF (Republic of Korea Air Force), though the US Army houses half of a battalion there presently, and there are a limited number of US Air Force personnel. As in most of South Korea, according to 2006 statistics compiled by the government, about 25.3% of the population professes to follow no particular religion. Christians account for 20% of the population and Buddhists 52%. The Catholic Diocese of Suwon was created in 1963 by Pope Paul VI. Suwon is famous for Suwon galbi, a variation on the style beef short rib enjoyed throughout Korea. The city also has the same variety of Korean dishes served throughout the peninsula and has a wide variety of restaurants serving food from outside Korea. Since 1995, Galbi festival has been held annually, attracting many tourists. Suwon's wildlife is similar to that of most of Gyeonggi-do. A notable species, however, is the Suwon tree frog. This is one of only two tree frogs to inhabit the Korean peninsula and it lives in the Gyeonggi-do area only. Former footballer Park Ji-sung grew up in Suwon. In 2005, a city street was renamed after him. ^ In the 19th century, Suwon was spelled Sou-wen. ^ "Suwon City Website". Archived from the original on |archive-url= requires |archive-date= (help). ^ a b c d e 수원시통계. 2011-01-12. Archived from the original on 2011-01-30. ^ "K-Leaguei". K-League. Archived from the original on 2010-04-30. Retrieved 2008-02-10. ^ "Welcome to Suwon city". Suwon City Council. 2007-10-20. Archived from the original on 2010-05-23. Retrieved 2007-11-27. ^ a b c Turnbull, Stephen. 2002, pp. 116-123. ^ a b "Hwaseong Fortress – UNESCO World Heritage Centre". UNESCO. Retrieved 2007-12-05. ^ 한국의 산하 - 광교산. Korean mountaineering association website. Retrieved 2007-08-07. ^ 사사동의 칠부산. Banwol Newspaper website. Archived from the original on 2007-10-13. Retrieved 2007-08-07. ^ 평년값자료(1981–2010), 수원(119) (in Korean). Korea Meteorological Administration. Retrieved 9 December 2016. ^ 기후자료 극값(최대값) 전체년도 일최고기온 (℃) 최고순위, 수원(119) (in Korean). Korea Meteorological Administration. Retrieved 1 August 2018. ^ 기후자료 극값(최대값) 전체년도 일최저기온 (℃) 최고���위, 수원(119) (in Korean). Korea Meteorological Administration. Retrieved 1 August 2018. ^ "Climatological Normals of Korea" (PDF). Korea Meteorological Administration. 2011. p. 499 and 649. Archived from the original (PDF) on 7 December 2016. Retrieved 9 December 2016. ^ 연령별 인구현황 (월간) (in Korean). rcps.egov.go.kr. Archived from the original on 2014-11-29. Retrieved 2015-09-30. ^ 영통구 연혁. Suwon City website. Archived from the original on 2008-12-10. Retrieved 2006-01-10. ^ 수원시 행정구역 (in Korean). Suwon City. Retrieved 2015-09-30. ^ a b 수원시 통계. Suwon City website. Archived from the original on 2013-02-19. Retrieved 2007-08-07. ^ a b c 수원시청에 오신 것을 환영합니다. Suwon City Council. Retrieved 2007-12-07. ^ "Welcome to Suwon City – Special Education". Suwon City Council. Archived from the original on 2004-08-22. Retrieved 2007-12-06. ^ 水原華僑中正小學 (in Chinese). International School Information, Government of South Korea. Retrieved March 30, 2016. ^ "Suwon City Travel and Tourism Official English Website". Archived from the original on 2013-11-11. ^ "Welcome to Suwon City – Sports Facilities". Suwon City Council. Archived from the original on 2004-06-24. Retrieved 2007-12-05. ^ "Welcome to Suwon City – Suwon Professional Team Introduction". Suwon City Council. Archived from the original on 2004-06-24. Retrieved 2007-12-05. ^ "The 5 Best Suwon Movie Theaters (with Photos) - TripAdvisor". www.tripadvisor.com. Retrieved 2018-05-05. ^ a b "Closed Amusement Park in Suwon". 오마이뉴스. 2007-03-07. Retrieved 2018-05-05. ^ 입력: 2008.06.16 16:50:31 (2008-06-16). "[지자체 소식]광교신도시에 세계적 호수공원 조성". news.khan.co.kr (in Korean). Retrieved 2019-03-18. ^ "Beautiful Restrooms". Suwon City Council website. Archived from the original on 2004-08-22. Retrieved 2007-08-07. ^ "Report presents legacy of car-free neighborhood". EcoMobility world Festival 2013. ICLEI. Archived from the original on 13 December 2013. Retrieved 13 December 2013. ^ Yu Sin-jae (유신재) (2005-06-12). 수원시 '박지성길' 만든다 [Suwon City constructs 'Park Ji-Sung Road']. Hankyoreh (in Korean). Retrieved 2007-08-08. ^ "Sister cities". Suwon City. Retrieved 2014-01-27. Wikimedia Commons has media related to Suwon.